When were Books invented? Historians tend to agree that Books were invented in c. 2000 BC and the first known use of Books were during the Ancient Egyptian: Early Dynastic Period (3100 - 2686 BCE) of invention. Definition of Books: Books are defined as a collection of sheets of paper (pages), or similar material, hand written, or printed and bound together and encased between protective covers. Who invented Books? 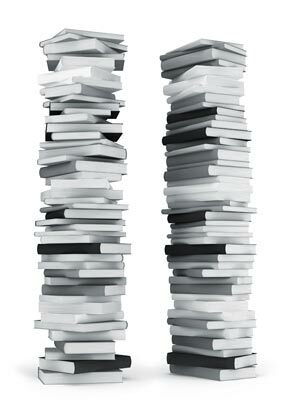 The evolution of Books began with the development of writing and the invention of papyrus, parchment vellum and paper. The invention of the Printing Press by Johannes Gutenberg moved from hand written books to mass produced books. The Industrial Revolution brought the invention of the high-speed steam-powered printing press. Ottmar Mergenthaler revolutionized the art of printing when he invented the linotype machine in 1878 and Christopher Latham Sholes invented the Typewriter in 1867. The ebook and desktop publishing emerged in the Computer Age and access to the internet provided a virtual library of books in our own homes. Fact 1: Who invented Books? The name of the inventor of Books are unknown but it is believed to have been invented in c. 2000 BC during the Ancient Egyptian era of inventions during the Early Dynastic Period (3100 - 2686 BCE). Fact 2: Who invented Books? The invention of books would not have been possible without the invention of writing and the alphabet. Several ancient civilizations independently invented their own alphabet. Fact 3: Who invented Books? The ancient Mesopotamian civilization created the first system of writing and the first alphabet c. 2900 BC. The Mesopotamians form of writing called "Cuneiform" was originally written on clay tablets and developed into an alphabetic script called Ugaritic. Fact 4: Who invented Books? The Phoenicians copied the Mesopotamian idea and developed the Phoenician alphabet c.3000 BC and the Ancient Egyptians developed their hieroglyphic script c.2400BC. Fact 5: Who invented Books? The Ancient Egyptians used Papyrus to write on c. 3000 BC. Papyrus was made from the pith of the reedy plant Cyperus papyrus which grew along the river Nile in Egypt. The first books were in the form of a Papyrus scroll consisting of several sheets pasted together to make one, super long sheet. Fact 6: Who invented Books? The Egyptian god of knowledge and the patron of scribes and writing was called Thoth. Thoth was revered as the inventor of Hieroglyphic Writing. The Cult Center at Hermopolis housed the Great Temple of Thoth, one of the great centres of Egyptian learning. There were secret halls in the Great Temple that contained historical records and papyrus books that encapsulated all the knowledge of Egyptian priests and scribes. These sacred texts and records were kept for thousands of years and were re-discovered during the late 15th century. Fact 7: Who invented Books? The Greeks and Romans adopted papyrus in later centuries which they used in combination with the Greek and Latin alphabets. Fact 8: Who invented Books? Papyrus was very costly and could only be obtained fro Egypt. A Greek ruler called Eumenes I (263-241 BCE) tasked his officials with creating a writing material to replace papyrus which led to the invention of parchment. Parchment was made of sheepskin, or goatskin which was was limed, scraped, soaked in tannin and dried under tension. Parchment made from calf skin was called vellum. Fact 9: Who invented Books? The Romans are credited with developing the first note book when Julius Caesar (100 BC - 44 BC) folded pieces of parchment over one another and created the notebook. The famous Greek poet Homer produced the 'Iliad' in book format which was described as "All locked within several pieces of skin folded into several little sheets". Fact 10: Who invented Books? The Ancient Chinese invented paper and a court official called Cai Lun (AD 48 - 121) is credited with significantly improving the paper making process 105 AD using the bark of Mulberry trees, rags of cloth, remnants of hemp and nets which were pressed into pulp to make paper. Fact 11: Who invented Books? The codex, an elaborate, hand-written book or manuscript, was constructed of a number of sheets of made from parchment, vellum or papyrus that finally replaced the use of scrolls. The hand-written books of the Middle Ages were, generally, painstakingly produced by monks. Fact 12: Who invented Books? The Chinese invention of paper eventually reached Europe in 1150 when it was introduced to Spain and then slowly spread to other European nations where new paper making businesses were established. Fact 13: Who invented Books? The invention of the Printing Press by Johannes Gutenberg (c1400 - 1468) in 1440. Press-printed books were created that allowed books to be produced quickly and, although still expensive, were much cheaper than ever before. Fact 14: Who invented Books? The Gutenberg printing press featured movable metallic type that created a system of individual letters and character pieces that could be rearranged and reused during printing. The Gutenberg printing press enabled identical versions of a book to be made multiple times. Fact 15: Who invented Books? Prior to the invention of the printing press it is estimated that there were less than 30,000 books in the whole of Europe. In 1455 Johannes Gutenberg began printing the Gutenberg Bible, the first mass-produced book. Up to this point a handwritten Bible that could take a single monk 20 years to transcribe working diligently in a scriptorium. Fact 16: Who invented Books? The printing press enabled thousands of books and millions of pamphlets to be printed without censorship. In the 1500's, both Catholic and Protestant churches and governments attempted to regulate and control the printing of books because it allowed for rapid and widespread circulation of ideas and information. Fact 17: Who invented Books? The lithographic system of printing, aka "chemical printing", was invented in 1796 by German author and actor Alois Senefelder as a cheap method of publishing theatrical works. Fact 18: Who invented Books? Friedrich Gottlob Koenig (1774 – 1833) invented a high-speed steam-powered printing press which was patented in 1810 during the early Industrial Revolution. The production of books increased with the invention of steam printing presses and new steam paper mills were introduced. The steam printing presses and mills caused book prices to drop and the number of books to increase considerably which led to the establishment of public libraries. Fact 19: Who invented Books? A German-American inventor Ottmar Mergenthaler (1854 – 1899) revolutionized the art of printing when he invented the linotype machine in 1878, the first device that could easily and speedily set complete lines of type for use in printing presses. Ottmar Mergenthaler has since been referred to as the second Gutenberg. Fact 20: Who invented Books? Christopher Latham Sholes (1819 - 1890) invented the Typewriter in 1867. Prior to the invention of the typewriter authors had to laboriously produce their books on hand written documents. Fact 21: Who invented Books? The emergence of ebooks took off in the computer age when Steve Jobs and Steve Wozniak of the Apple corporation the first Personal Computer in 1976. Fact 22: Who invented Books? In 1990 John Galuskza (Serendipity Systems) invented an ebook display program called PC-Book which revolutionized the book publishing industry and opened up the opportunities for authors. Fact 23: Who invented Books? Computer based word processors, printers and the advent of desktop publishing allowed people to print their own books and access to the Internet has provided a virtual library of books in our own homes. Who Invented Books? - History of Books - Invention - Definition - Meaning - Famous - Device - Innovation - Significant - Evolution - Development - Education - First - Definition - Kids - Facts - Information - Info - Who invented Books - Dates - When - Why - Impact - Purpose - Use - New - Old - Books Definition - Meaning - Awesome - Cool - Who invented Books - History - Books Timeline - Who Invented Books?